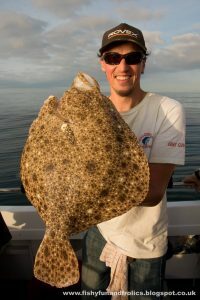 Fishing for these magnificent flat fish has become something of a speciality of ours at Brigand Charters and there is a definite knack to successfully landing one. They are ambush predators and occupy a variety of habitats off the Sussex Coast, often at distance, which is generally where we head for them. They will take variety of baits/lures when presented in the right way and conditions impact greatly on which method is likely to land you one of these King of fish. Arguably the finest eating fish to be caught in UK waters with a price tag to match – We have boated many Turbot which would cost over £300 per fish. Taking one of those home would not only earn valuable brownie points but also result in less resistance when booking “another” fishing trip! They really are a must-do trip and a lot less frantic than wrecking.